Dawn Lutrell is an Oregon-based standup comedian, writer and addiction recovery speaker/advocate. Once upon a time at the young age of 48, Dawn Lutrell decided the world needed more to laugh at. Even without the help of her fairy godmother (who was busy hot-flashing and learning tai chi), Dawn magically transformed into a sought-after stand-up (except when she’s napping) comedian and addiction recovery speaker. She has performed in clubs and recovery conferences all over the West Coast – including a showcase at ‘The Comedy Store’ in La Jolla, California, where she also opened for the ‘Best of San Diego’. 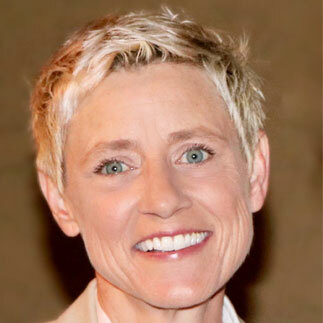 In 2018, a hilarious audition video of Dawn impersonating Ellen caught the attention of Ellen DeGeneres herself and featured Dawn in her opening monologue for The Ellen DeGeneres Show. Dawn has also been featured in “In Recovery Magazine”, “Sober Life Radio” and was the featured humorous speaker at the 2017 “Woman to Woman’ Conference in Honolulu, Hawaii. Dawn was recently a “Super Finalist” in the national 2017 “Comedy with Class” competition and closed out the 2017 ‘NW Women’s Comedy Festival’ at The Wildish Theatre in Eugene, Oregon (tie-dye and dreadlocks not included). More than anything, Dawn wants to give audiences the gift of laughter… as long as she doesn’t have to wrap it or send a card. For anyone seeking a fun conference speaker or evening comedy act, someone who is authentic and can take audiences on a journey to find themselves while they find the funny, contact Dawn.